Manchester City forward Georgia Stanway says it is too early to consider their meetings with rivals Chelsea as Women's Super League One title deciders. Chelsea host defending champions City on Sunday, in the sixth round of games within an 18-match season, with both sides in the top two, unbeaten so far. Leaders City hold a 100% record while Chelsea are two points adrift but three points clear of third-placed Arsenal. "There's still so much to play for. It's only Christmas," Stanway insisted. "We're heading in the right direction but we have to remember we're only halfway through the season. "If the wins keep coming then things might fall in to place, but you never know with football." 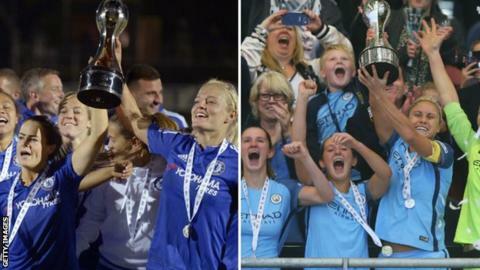 The two sides have finished in the top two league places for the past three WSL 1 campaigns, including 2017's transitional Spring Series, won by Chelsea. "We have to not forget that it's going to be a big game," Stanway added to BBC Sport. "Chelsea have got a lot of good players and internationals so it will be a very challenging for us."